We’d love your help. Let us know what’s wrong with this preview of Summer Heat by Rachel Van Dyken. For one night, we put all labels away and I spent the best nigh Spoiled Princess is what he used to call me. To ask other readers questions about Summer Heat, please sign up. is this out yet? I cant find it anywhere!! SUMMER HEAT: Is the first contemporary novel in Racheal Van Dyken’s ‘Cruel Summer’ series. It had been the best kiss of my life. And I'd ignored him the next day. Marlon and Ray are your typical enemies which made for a riveting read, saying these two were a hot mess was an understatement, they were all over the place, the Princess and the Pauper, Marlo has a chip on his shoulder a mile wide when it came to Ray, he was a fostered kid who mowed their lawns, the unprivileged boy always looking in from the outside into a gilded cage where the beautiful princess resided, but if he’d looked further he’d see a sad, lonely kid just like him, parents that didn’t give a damn, guys that used her as a trophy just to make them look good. Marlon was the skinny boy with glasses that was regularly picked on by the bigger kids. Four years later these two meet up again at an exclusive drama summer camp the last person Ray ever expected to encounter was Marlon. The boy she had a one night stand with, the boy that she ignored the next day. The boy that got thrown into a locker right in front of her eyes and she didn't say anything. Now the jokes on her, he's no longer that skinny little boy, now he's drop dead gorgeous. His shirt was so tight I could see his eight pack. protein shakes, and the tears of people who defied him? But he's still got revenge running thick in his veins. A super quick, sizzling hot read, the sexual tension between these two dripped off the pages. 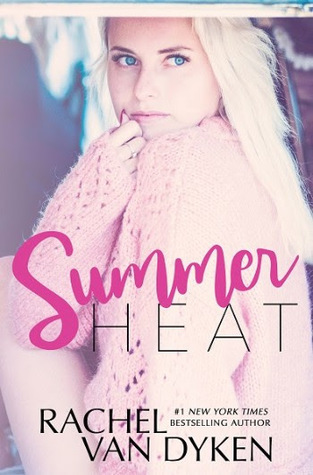 With “Summer Heat,” the first of the Cruel Summer trilogy, Rachel Van Dyken delivers on its title, turning up the temperature between two enemies who have so much passion between them they can't hide it and can barely contain it. While Ray had looks and money, Marlon was the nerd foster kid who mowed her lawn and the popular kids picked on. All through high school she loved him from afar but wanted acceptance even more. She ignored him while others made fun of him, except for the night they had t With “Summer Heat,” the first of the Cruel Summer trilogy, Rachel Van Dyken delivers on its title, turning up the temperature between two enemies who have so much passion between them they can't hide it and can barely contain it. While Ray had looks and money, Marlon was the nerd foster kid who mowed her lawn and the popular kids picked on. All through high school she loved him from afar but wanted acceptance even more. She ignored him while others made fun of him, except for the night they had together and then she took the scholarship that would have set him free and moved away until she got a job in the country’s best drama camp where Marlon is now director. Four years after she left, Marlon is finally at a place where he’s happy. No longer a scrawny nerd, he’s a successful college graduate and the man in charge of helping campers while making Ray’s summer miserable because revenge is a plate best served during summer camp. But after spending time with her and seeing her vulnerability, will he still want payback or just her? With Ray, RVD has crafted a determined and endearing heroine who wants more affection than what life has given her and her fiery character is matched by a likewise intense hero. As the days go by in camp, the two flash back to their time in high school and fueled by their verbal sparring, the irrefutable attraction between them begins to burn. The romance between Ray and Marlo is a scorcher, but its sparks are repressed by their unresolved past. I was hooked by the characters and plot in this enemies to lovers story. It was full of passion and heartbreak and I can’t wait to read the next installment. Summer Heat is book #1 of the Cruel Summer trilogy by Rachel Van Dyken. Told from both points of view with a cliffhanger. 3,7. Apesar de gostar bastante desse tipo de livro, não consegui me conectar com a situação. Achei surreal as coisas e sem explicação dos fatos. Summer Heat by Rachel Van Dyken is your quintessential must read this summer! It’s one of those light easy reads that hooks you right from the start. RVD introduces readers to Marlon and Ray. Ray is your rich privileged girl and Marlon is the skinny foster kid, who mows her lawn. Ray and Marlon shared a moment but the next day, she ignores him. Fast forward four years later, Ray and Marlon meet again but this time around, Marlon isn’t the same skinny boy as she remembered. So what happens when these two are in the same room? Will these two find themselves as enemies or lovers? As I was saying earlier, this is definitely your sweet, fun, playful and yet riveting summer read. It is one of those stories that grabs your attention as you eagerly await what will become of Marlon and Ray. As always, RVD has written characters that are relatable so readers like myself are invested to these charismatic characters. Oh my gawd !! RVD comes at ya with a sizzling summer read, full of sexual tension that might just melt your IPad, iPhone whatever device you use to read. Marlon and Ray are enemies. Ray is the spoiled rich princess and Marlon is the foster kid who mows her lawn and gets picked on at school. Years later these two meet up again and Marlon isn’t that skinny kid anymore and this time he’s set to make her suffer. These two are like fire together and there is definitely no love lost whatsoever. That o Oh my gawd !! RVD comes at ya with a sizzling summer read, full of sexual tension that might just melt your IPad, iPhone whatever device you use to read. These two are like fire together and there is definitely no love lost whatsoever. That one night years ago forgotten. Oh man this book was so good. I was giddy from the get go and I knew that this was gonna be good. I loved these two and their battles, for me it just added to their insane chemistry and you could feel it dripping off the pages. All I kept thinking was oh my god what is going to happen next. I couldn’t read fast enough and then well and then I felt like I read too fast. And I’m literally sitting here screaming for more. I need more so badly it’s not even funny. I’m hooked on this story. I’m hooked on the characters. Ray and Marlon will pull you in all directions. I feel this is RVD's best work to date. So what happens when the one person from your past, you really wanted to forget about - all of a sudden shows up at the Summer camp you are the director at? Well for Marlon - it brings up a lot of anger and maybe some revenge. Ray and Marlon had been friends since they were little kids. With his foster mom working for Ray's family, she was always a part of his life. Until High School things changed. Ray was th Ray and Marlon will pull you in all directions. I feel this is RVD's best work to date. Ray and Marlon had been friends since they were little kids. With his foster mom working for Ray's family, she was always a part of his life. Until High School things changed. Ray was the popular girl. Dating the captain of the football team. The IT girl. While Marlon was the skinny nerdy kid who had a major crush on Ray. One night. He thought everything changed, until the next day... it seemed everything was back the way it was before. So when Ray shows up as a camp counselor at the theater camp he's the director of years later. All he sees is red. And maybe making her life miserable. Drama de leve do jeito que eu gosto. A RVD tem uma escrita gostosinha. Ray é a clássica pobre menina rica negligenciada pelos pais, que não lida bem com o fato de nunca ter se sentido amada. Marlon foi adotado pela empregada da casa da Ray aos 6 anos e eles são amigos até a adolescência. Plot comum, que se desenvolve de modo bem previsível, mas gostei porque simpatizei com os personagens. Claro, que há partes mais dramáticas e uma leve forçada de barra para a Ray ser tão triste como é. Porém, é um Drama de leve do jeito que eu gosto. A RVD tem uma escrita gostosinha. Plot comum, que se desenvolve de modo bem previsível, mas gostei porque simpatizei com os personagens. Claro, que há partes mais dramáticas e uma leve forçada de barra para a Ray ser tão triste como é. Porém, é um rapidinho de ler e me prendeu. Gostei. Summer Heat by Rachel Van Dyken is book One in the Cruel Summer series. This is the story of Ray and Marlon. Ray is thought of as a 'Princess' and Marlon was the boy that mowed her lawn, a foster kid and one that the other kids picked on. They were never really friends, although both thought the other one was attractive. Ray did go along with the other kids sometimes to stay cool and which did cause Marlon to be hurt. Now years later Marlon is totally different and they find themselves together Summer Heat by Rachel Van Dyken is book One in the Cruel Summer series. This is the story of Ray and Marlon. Ray is thought of as a 'Princess' and Marlon was the boy that mowed her lawn, a foster kid and one that the other kids picked on. They were never really friends, although both thought the other one was attractive. Ray did go along with the other kids sometimes to stay cool and which did cause Marlon to be hurt. Now years later Marlon is totally different and they find themselves together again. Sparks fly again and love it tempted but something happens pulling them apart due to their past. ARE YOU KIDDING ME WITH THAT CLIFFHANGER? RVD does it again with the first instalment of this series. I was captivated by the characters and their history, and getting to know them in by present. Watching them interact and trying to work out how they felt about each other was awesome. This is a really fast read and with that ending I CANNOT WAIT for the next instalment to be released. I really want to dig deeper into the story of Marlo and stay and see where this road will take them both. Things aren’t always as they seem, and I really can’t wait to delve into that some more. Book two hurry up please! Nooooo! 😭😭 I NEED THE NEXT BOOK NOW! Omg. Im a sucker for brooding assholes, for enemies to lovers books & for second chances. There is so much depth to this baby, so much heartache, I felt my soul come apart while reading it. It’s such a hot book, because the chemistry between Marlo and Ray is sizzling. This is a book about betrayal, about love & about judging a book by its cover. It’s amazing and the next addition can’t come any faster! It was a good story. New adult usually not my genre and I hate many of its books but I liked this book . I liked listening from the rich princess for the first time . This story shows that a person could change and that appearances isn't everything.I wished the more deep meanings took most of the story but I think this genre defines how the story goes.I liked the author writing style,too. A super quick read. Enemies to lovers. Set in a drama summer camp. The chemistry between these two characters sizzled! And that ending?! Saw that one coming. I’m glad book two is already out! And part of me, the part that loved her fire, smiled and craved the challenge that she would bring. The fire that she hid beneath that pretty exterior. The fire just begging to be freed from its pretty prison. And maybe, that was the problem. A super quick read. Enemies to lovers. Set in a drama summer camp. That ending! I love how this was a novella, it's worked perfectly and I need more right now!!! 😭 cant wait for the next two books! I read the blurb and kept obsessing about this series, checking my husband's ipad like a lunatic. The moment the last book was out I was like I really needed to kiss all the ipad angels for ending my misery. I should admit that the book didn't stand a chance in front of the blurb. Yes, the blurb was so strong and interesting it gave me goosebumps. Don't get me wrong, I loved the story so much, but there were so many things that were missing from the love/hate relationship that made things weird for me. I have never been more happy that I read on an iPad than I am right now. I am sooooo glad I got to read this book by Rachel. "I was asking for trouble. And heartache all in one. But his eyes? Those eyes, they haunted me." I've read a lot of insta love stories the past few weeks, not by choice but because I signed up for them not knowing that they were that kinda story. Luckily they all turned out to be good books despite that aspect. The issue I have with insta love is that it takes away my fav I have never been more happy that I read on an iPad than I am right now. I am sooooo glad I got to read this book by Rachel. I've read a lot of insta love stories the past few weeks, not by choice but because I signed up for them not knowing that they were that kinda story. Luckily they all turned out to be good books despite that aspect. The issue I have with insta love is that it takes away my favorite part of reading romance. I read romance because for me seeing two people fall in love is the best thing ever. Watching them slowly realize their feelings for each other, watching them fight it, seeing them realize they can't and then watching them go after what their heart wants. It's best thing about romance books. Sometimes seeing what is right in front of them before they do and rooting for what you know is meant to be is the best. The flutters that develop in your stomach or the ache in your chest because it just hurts, those tings come along with "the chase". God, I love the chase. When it's done well, it can be the best part of the book. You do not get any of this with insta love. "Ray and I? The princess and the pauper? Unlikely. I think we'd rather kill each other." Why I am saying all of this? Well, simply because Rachel slays me every time. She gives me everything I need from a story and then some. It's one of the things I love about Rachel's writing, she gives me exactly what I need at the moment it's needed in a story. I only started reading her books last year. I have, since then, read pretty much every one of her back list books along with all of the ones that have released along the way. The first book I read was The Matchmaker's Replacement. I had received an email asking me to join the blog tour and review it. I am so glad I did. Lex is still my favorite guy from her although Chase Abandonato is pretty much tied with him. "I found my soul in that moment. Tethered to his. Like I knew it had always been." Anyways, Summer Heat delivers yet another reason to fall in love with her writing. Marlo and Ray had so much chemistry it leaped off the screen. The story made me smile, made me swoon, and wouldn't let me go till the end. It's a novella and I read it in one sitting. The ending is brutal but then again I live for endings like that. I love cliff hangers. That feeling you get when you go "OMG nooooo", well that means the author did what she was supposed to and that's the sign of a great book. I am so ready for the next book. I am a sucker for hate to love, so when one of my favorite authors decided to feature this trope with a summer twist, I couldn't wait to dive in. Marlo is a little aloof in the beginning, but he quickly won me over. I adored Ray and ached for her struggles with abandonment. Ray and Marlo have a past but this romance is focused on the present. RVD does a fantastic job creating sexual tension and chemistry between these two. I couldn't get enough of the banter and stolen tender moments. "Things are I am a sucker for hate to love, so when one of my favorite authors decided to feature this trope with a summer twist, I couldn't wait to dive in. Marlo is a little aloof in the beginning, but he quickly won me over. I adored Ray and ached for her struggles with abandonment. Ray and Marlo have a past but this romance is focused on the present. RVD does a fantastic job creating sexual tension and chemistry between these two. I couldn't get enough of the banter and stolen tender moments. "Things aren't always as we believe them to be." This is going to be a three part serial featured exclusively on iBooks. While I thought there would be a cliffhanger, I was not prepared to hurl my iPad across the room because of the torturous ending! I am thankful there's only a short wait until the next installment. Cruel Summer was a fabulous beginning to a promising new series. You guys can tell when I'm stoked about something, right? I am STOKED. I'm in love with this story. The Cruel Summer series is made up of three parts. Summer Heat is part one. It's exclusive to iBooks right now. This was my first time reading on my iPad instead of my kindle. I know shocker right. I loved it. So don't be afraid to try out iBooks if you aren't currently using it. "You know how people have enemies and then the people you know would drown you in a pool of your own blood if they had t You guys can tell when I'm stoked about something, right? I am STOKED. I'm in love with this story. The Cruel Summer series is made up of three parts. Summer Heat is part one. It's exclusive to iBooks right now. This was my first time reading on my iPad instead of my kindle. I know shocker right. I loved it. So don't be afraid to try out iBooks if you aren't currently using it. "You know how people have enemies and then the people you know would drown you in a pool of your own blood if they had the chance? He was the latter. The one person who could ruin my day with a stare. The one person alive that could ruin my life by simply existing. The hate between us was thick." Marlo and Ray essentially grew up together, but one was privileged the other not. One night they shared something deep between them. The next day she couldn’t even stand up for him. Fast forward through college and now he’s her boss for the summer. If you’ve had those high school hurts you know how difficult it is to get over it. So of course you’d think he’d make her pay for it during camp. And that sort of happens but there’s also more. Unti I received a free copy of this book from the author. Until his friends ruin the progress he’s built with her. Sometimes you just want to smack people upside their heads! Wow! What a start to this series! Marlon and Ray have such a strong connection, and man, you can feel it pouring out of the pages. Woo! These two have a wild love/hate relationship that will have your head spinning. I love them! Having grown up together, although in very different manners, Marlon and Ray both think they know all there is to know about each other, but things are quickly coming to light. Man, that ending has me dying for the next book. I’m so anxious to see what’s going to happen. Wow! What a start to this series! Marlon and Ray have such a strong connection, and man, you can feel it pouring out of the pages. Woo! These two have a wild love/hate relationship that will have your head spinning. I love them! Having grown up together, although in very different manners, Marlon and Ray both think they know all there is to know about each other, but things are quickly coming to light. Man, that ending has me dying for the next book. I’m so anxious to see what’s going to happen. You can see my full blog post HERE. For starters, I’m not a huge fan of enemies-to-lovers (The Hating Game is always my exception). You’re probably thinking “well, you shouldn’t have picked up this book!” and you’re right but I can’t say no to Rachel Van Dyken’s books so You can see my full blog post HERE. Summer Heat is a quick read that had me hooked from start to finish. An enemies to... (let's hope) lovers story, this first book in the trilogy is full of delicious tension. And, it brought me back to summer camp - truly one of my favorite places on earth! Ray and Marlo are complete opposites. And you know what they say about opposites - explosive chemistry. These two are drawn to one another time and time again, yet there's an underlying fierce anger boiling in each of their souls. This story will leave you on your knees begging for more. 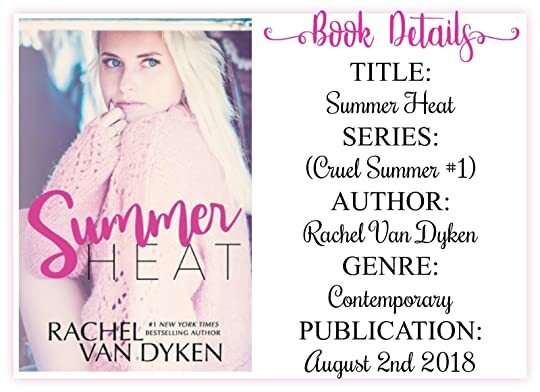 Summer Heat by Rachel Van Dyken is the first book in her iBook exclusive Cruel Summer series and one of my favorite Rachel Van Dyken stories yet! The blurb alone gave me all the feels! A spoiled princess and the boy who was ridiculed and how years later, so much has changed. Sign me right up! Ray watched Marlo for years. Then they shared one night, but the next day, she acted like nothing happened between them. Years later they are adults and he is not the man you laugh at anymore. But she is ev Summer Heat by Rachel Van Dyken is the first book in her iBook exclusive Cruel Summer series and one of my favorite Rachel Van Dyken stories yet! The blurb alone gave me all the feels! A spoiled princess and the boy who was ridiculed and how years later, so much has changed. Sign me right up! Ray watched Marlo for years. Then they shared one night, but the next day, she acted like nothing happened between them. Years later they are adults and he is not the man you laugh at anymore. But she is everything that angers him about his past. Now they are working together and he does not let her forget what he suffered. Even with all the animosity between them, you can feel the chemistry between them as well. Can Marlo ever forgive Ray? All Ray wants is for him to see her for who she really is, but is it too late? I loved watching the back and forth between these two and the tension they felt! I have to say Rachel Van Dyken never disappoints! I loved Summer Heat and cannot wait to get my hands on the second book! That ending! 4.5 stars! 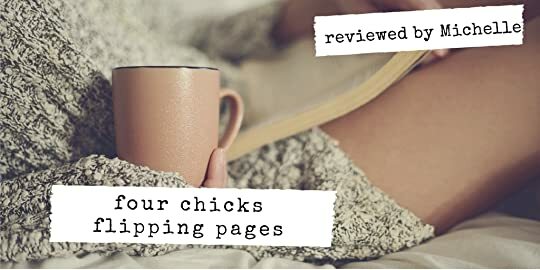 Read and reviewed for Sultry Sirens Book Blog.